Aces represent the very best a suit has to offer, the un-tapped, raw energy of the suit. Pentacles represent money, the coming together of a process, or other earthy gains. The Ace of Pentacles, when upright, indicates that everything that’s needed is being provided, along with a little bit of divine intervention. It’s golden opportunity. When inverted, it could indicate that either the energy of the card is just beginning to manifest and hasn’t peaked yet, that it’s a waning energy that’s on its way out, or that there may be a lack of faith in regards to believing that what is needed will be provided. When upright, I get a jolt from this card… an excited wiggle because I get excited for the person who drew the card (even and especially if it’s myself!) because I know that the quarrent is about to receive a much needed hand. When inverted, I’m inclined to advise to have faith and trust in a higher power, in Universal wisdom, and know that everything will be taken care of. Abundance; wealth, a monetary contract; accomplishment; good news; a new start, especially in financial and property matters; gifts; positive material gain; new business proposition. 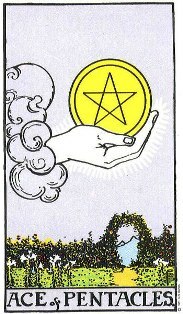 The Ace of Pentacles is a symbol of possibility in the area of prosperity, abundance, trust, security and groundedness. In readings, it shows that a seed of productivity has been planted in your life although you may not yet recognize it. When the seed sprouts, it could take almost any form. It might be a feeling of centeredness, desire for results or need to focus on practical matters. On the outside, it could be an offer, gift, opportunity, encounter or synchronistic event. When you see this Ace, examine your life to see how its solid energy could work for you. Now is not the time for fantasy, drama or daring. It is a time to be real and centered. Seek out comfortable, reliable experiences that make you feel secure. Build a foundation of trust in your life both within and without. Your common sense will tell you what to do. Focus also on the natural world to help you stay grounded. Enjoy your body and all the joys of material existence. The Ace of Pentacles can be a sign that you will be able to make your dreams real. Your ideas are ready to be turned into something tangible. Figure out what will work and make it a reality. You can now attract all the wealth you need to get your projects going. Tap into the material force of the Ace of Pentacles, and all your enterprises will flourish. Aces are the root force. They are the spark. Relate them to the Magician, who presents the tools to the Fool. They have no purpose yet, but are filled with raw potential. They are the active energy of the suit ready to be used. They can also indicate direction or season, though which stands for which is often debated. Here are the “usual” directions and seasons. If, however, they don’t feel right to you, the reader, use whatever works best. New luck, health or money for a new “job”. There is no desire to burn, or flow or fly; here is a physical need to be grounded, to do solid work, make, create and touch. Like a seed in the ground, there is a desire to sprout roots and just become. The pentacle is taken in hand, and, for now, the querent wants only to have it solidly in his pocket. These are the aces, the raw or initial passion, feelings, thoughts and needs that can be directed into something more. They represent hope, a possiblity, an action to take. The Querent can use them, or leave them behind. Choose wisely what you take up from the Magician’s table for each has its pitfalls as well as pinnacles.